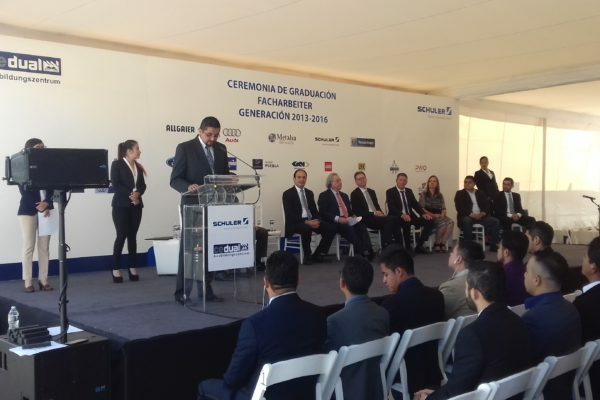 The second intake of apprentices from the Schuler ‘Cedual’ training centre in the Mexican city of Puebla celebrated their graduation last week. 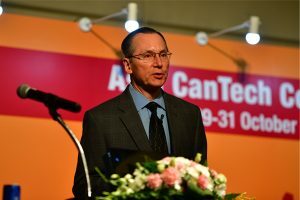 Over the past three years, the young specialists have acquired the precise expertise and capabilities, which are in demand in the rapidly growing automobile and supplier industry in Mexico. Alongside Schuler management, the sub-director of the Mexican Chamber of Commerce, Andreas Müller, as well as the chairman of the supervisory board of Allgaier Werke, Dieter Hundt joined in the celebrations. Ford has already decided to sign up 21 of its Mexican employees for a basic course at Cedual. Additional companies such as Audi, Allgaier, ThyssenKrupp, LuK, Gestamp or PWO are also letting their junior team members attend courses at Cedual. The training centre is equipped with drilling, turning, milling and grinding machines, numerous workstations, an audiovisual lecture theater and three classrooms, and offers a total of 90 spaces. Theoretical and practical phases are alternated, in a similar manner to the dual training concept driven in Germany. Both the content and the standard of training are fully in line with the German model.